Important Q: Can Real Food Become An Idol? Do you intentionally grow bacteria on your counter? Have you ever sipped a glass of raw milk while researching whether you should soak, sprout, sour, or just ditch your grains altogether? Have you felt overwhelmed by the things others say you should be doing, yet you have trouble managing it all? Honestly, keeping up with the real food world can be discouraging and downright depressing. If you allow it to be so. The problem is that we can become so obsessed with buying food or making recipes in order to become better parents, better spouses, better employees, or better people. And then we might elevate food too high — place it on a pedestal where it was never meant to be. It was once, for me. I've spent many Sunday school and Bible study lessons teaching kids in Mexico not to have any gods before the one true God. We talked about all the things they might value over God while I overlooked my own — nourishing real food. Real food does. not. save. you. Real food is not God. We shouldn't idolize it and allow it to take the place of God in our lives. Now, for those of you with serious health needs (such as celiac disease), I'm not saying to eat anything that would harm you. This is directed toward those of us without serious medical issues that are directly food-related. Food is a gift, and I am extremely grateful for it. I believe that we are called to be good stewards of our bodies. I believe that eating good food is a way of answering that call. However, food is not an end-all. It's okay to compromise from time to time. Many people like to embrace the 80/20 rule: 80% real food and 20% compromise foods. Your compromise could be an instant cup noodle or organic ice cream. It's fine; just strive to not make those compromises every day. Compromises might also be the simple things like buying a regular chicken from the store instead of a pastured one because you can't afford it. Maybe it's buying canned coconut milk instead of making your own. Whatever it is, do your best, trust the Lord, and don't worry about anything out of your control. We can spend all our time stressing over whether or not we're feeding our families the perfect diet, but in the end, all that stress can be just as unhealthy as a non-organic strawberry or unsoaked wheat. 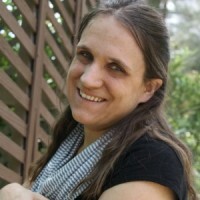 Last year when I attended Allume — a gathering of many amazing, Jesus-loving gals — I sat around a table with friends like Richly Rooted, My Humble Kitchen, Hilary Berstein, Don't Waste the Crumbs, The Humbled Homemaker, Back to the Book Nutrition, and many others. We enjoyed food, broke bread, laughed, prayed, and even ate cupcakes with lots of processed white sugar, flour, and hydrogenated shortening. But you know what, they were tasty and it was SO freeing. Do we eat like that every day? No, but we were grateful for the provided food, and so we dined. There is a sacred holiness to the breaking of the proverbial bread together. So much of Scripture takes place over a meal. Some of Jesus' last teachings were at the table. …we are saying no to the joy that they have in preparing a meal for us. I get it — it can be hard to eat foods we know are not nourishing to our bodies, yet the fellowship gained may make it worthwhile. There's always balance. What message do we send to people when we tell them we can't eat with them because their food isn't good enough? Unfortunately, food is such a personal issue that people on both sides take offense far too easily. But can't we occasionally put aside our differences, for the sake of others? Last summer I visited friends in an indigenous village in southern Mexico for a Quinceanera. I was offered a place to stay that evening, along with a few others, and we arrived at the tiny cinder block house at midnight expecting to crash into bed. Instead, the hostess greeted us with a meal of chicharon (pork skin) soup, tortillas, and instant coffee with powdered creamer. She sacrificed so much to serve us — staying up late, keeping the food warm on her wood-burning clay stove. It is a constant battle not to say no to the sweet hospitality and fellowship we are offered, but I believe it is worth the fight. These verses refer to meat sacrificed in pagan temples, but I think they apply here as well. This phrase really irks me: “Better to spend money on food now than pay a doctor later”. Is it true, at least part of the time? Yes. Do I practice it myself? You better believe it. But here's the thing. Health is not a guarantee. My mom, and aunt, and cousin have some of the best diets in my family, but they have all had cancer (and survived, thank the Lord!). Other family members, who eat substantially less-than-perfectly, cancer hasn't touched. Our only true Salvation is through Christ. It reminds me that our only true salvation is through Christ. We can be guilty of claiming that our healing comes through real food, while forgetting where the food came from. Real food is not our God. I still believe that we should all eat as much real food as possible. I am thankful for all I am able to buy and grow, and I strive to check my heart and make sure food never again becomes my idol. Have grace upon yourself, have grace upon others. Eat and be thankful! 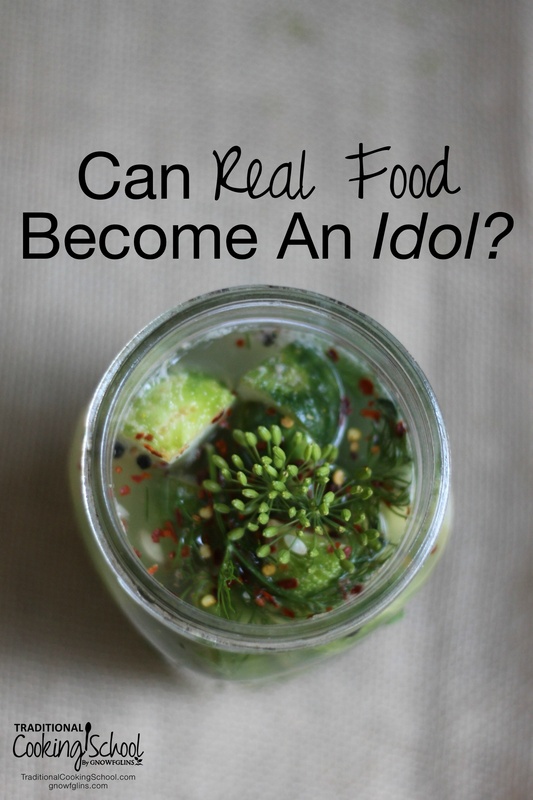 How about you: do you think real food can become an idol? Oh, Katie Mae, ouch, ouch, ouch! This really hits home and is something I have to remind myself of often. Thank you so much for your boldness to speak the truth in love to us. I love hearing the sweet story of the woman who cooked for you in Mexico. What a true servant and how terrible if anyone had turned down her sacrifice of love! And how do I get an invite to that Allume thing?! I wanna go! You buy a ticket. 😉 I missed this year but am hoping to go next year, it was a blast! It’s been on my heart for a year or so, thanks sweet friend! God is so gracious and His word true! Thank you! It’s a daily struggle for me as well. Thank you so very much for this post today, I have been searching for a way to tell my followers on Goodnews from the garden and You said it all. Thank you again for sharing such good intructions on healing the body God’s way. I wish you had mentioned the strain on relationships. I’m not an organic eater. But, I have several close friends who are. Without exception it has caused great strain on the relationships within the immediate family. Is “real” food really worth having constant stress in your marriage? Is “real” food really worth being estranged from one or more of your children? Oh, this saddens me to read this. You made a good point, that may end up being a post in the future. It really is a hard balance. For some people, they have serious dietary needs that require them to skip processed foods and non-organically raised food. Personally I try to find a middle ground when I am with friends and family. For example I ate very junk food pizza last week at a gathering for a friend, we had a fun time but I felt miserable the next day because of the effect the food had on my body. I pray that your friends and their families will find that balance. Food is sensitive to all of us on some level. I do think eating as close to how God created foods to be is important, yet it shouldn’t prevent us from those very important relationships. It’s hard for me to put myself in someone else’s shoes since I don’t know the entire situation or them personally. Perhaps there needs to be more compromise and grace on both sides? I really appreciated this post. I am a young mother trying to do my best at feeding my family of four and this was very encouraging. I am so glad! Blessing to you! Thank you so much for this!! I had been feeling lately like I was making food an idol. I went to a few friends and they encouraged me that I was doing the right thing. But it never felt right for me. So lately I have been buying conventional turkey and chicken as well as conventional veggies – steering clear of the dirty dozen. We are a family on one income and it is my responsibility to honor my husband by not using up all of our money. Honoring my husband and children by preparing real foods while being able to save AND putting God first is so important to me. When we are financially able you better believe I will be buying pastured chickens. But you are so right!!! Our healing comes from God!! ???? Thank you for posting!! You are so welcome, you better believe that I will be buying pasture raised when I can too! 🙂 Right now I buy organic or conventional depending on the price. I liked reading your post. It is so true that food can become an idol, a lifestyle can become an idol, just about anything can become an idol if we let it consume us. I enjoy cooking with wholesome foods for myself and for others. I like knowing that my food choices mean I’ve supported humane treatment of animals and sustainable farming, as well as the farmers and butchers who do the hard work for me. As to the health benefits, who knows if its truly better. I know a woman who is 92 living on her own in her own house. If you give her a dozen donuts, she will eat 3 per day – one for each meal – for 4 days. She’s happy as a clam, not overweight, and moving pretty good for 92. I’m afraid I see it becoming exactly that for so many people, not just Christians. We’ve even fallen back into the language of purity laws – ‘Clean food’ is a common term for foods which are considered acceptable to eat. And I also see elements of moral judgement creeping in against those who don’t observe the same dietary standards. And yet “It is not what goes into the mouth that defiles a person, but what comes out of the mouth” (Matt. 15:11). As regards the social dimension of food, I learned a lovely lesson in grace from a devout Catholic friend who observes three to four days each week as meat-free. I was discussing with her the difficulty of having a birthday that always falls during Lent (which, as an Anglican, I observe, typically by giving up all alcohol and chocolate), and therefore struggling when family and friends gifted me with wine or chocolaty foods. She explained that on those occasions it is considered more important to respect the intention of a person who offers food than to keep to the letter of the fast – in other words if, on a meat-free day she found herself dining with someone who had prepared meat without knowing she was abstaining from it then it was considered more ‘charitable’ (loving) to eat it without comment than to decline. Likewise, if I were given wine or chocolate, and if the intention was that I should eat them with the giver, then I should consider myself free to do so in the name of love. She also explained that for Catholics Sunday is always considered a feast day, and therefore is automatically a ‘day off’ from Lenten (and other) restrictions. Love that verse, I wish I would have remembered to use it! What a beautiful example your friend has shown! My parent’s taught me to do likewise during Lent as a child. Thank you for this article!! I have gone away from reading many real food blogs because I’m tired of the guilt. Realistically, I eat a really good diet. But, I don’t want to go on GAPS (am I only one who feels pressured to do this every time I tune into a traditional food blog!?) and I don’t eat perfectly all of the time. My kids ate Halloween candy. And I’m starting to be okay with that. I believe God expects us to take good care of our bodies, but when we obsess about healthy food and it takes time from worshipping Him, it’s not good. Thanks so much! It is good for me to be reminded of the truly important things in life. Even tho I believe it is good to see food as what God made for us and to eat it in the way He intended, it must be kept in its place. And for me also I have to choose what are the best options that we can afford and use my husband’s income wisely. So do I! My diet is not 100% sourced how I would like it to be but my hope it that someday I can and that you will as well. Love this post, Katie Mae! Thank you for writing this! I have been hurt deeply in the past by others who have put food before people. And as someone who wants the healthiest choices for my family but is currently unable to afford most of it, I often struggle with guilt & feel pulled between healthy food vs. a tight budget. This is so refreshing to hear! I am learning to do the best with what I have & not worry about what I can’t afford this week. And you’re right . . . ultimately, Christ is what matters, not what we eat!! Great article & very encouraging!! You’re welcome, Elisabeth! I still have to remind myself of that as well. Thanks Katie Mae, I have learned this too…the hard way. Now I buy what I can afford, I try to buy some organic, grass fed meat, and some conventional meat each week. It’s the best I can do for now, and I’m happy with that. I need to remember though, that if I can find time to soak oats or beans, then surely I can find time to spend resding God’s word. Thanks again, a true blessing for me. You’re welcome. Since I am in the same boat I frequently have to remind myself of this as well.